Pattern Description: Pants with slightly flared leg, front crease, and side zipper. Pattern Sizing: Burda sizes 38-46. I used a size 42 at the waist and a size 44 at the hips. 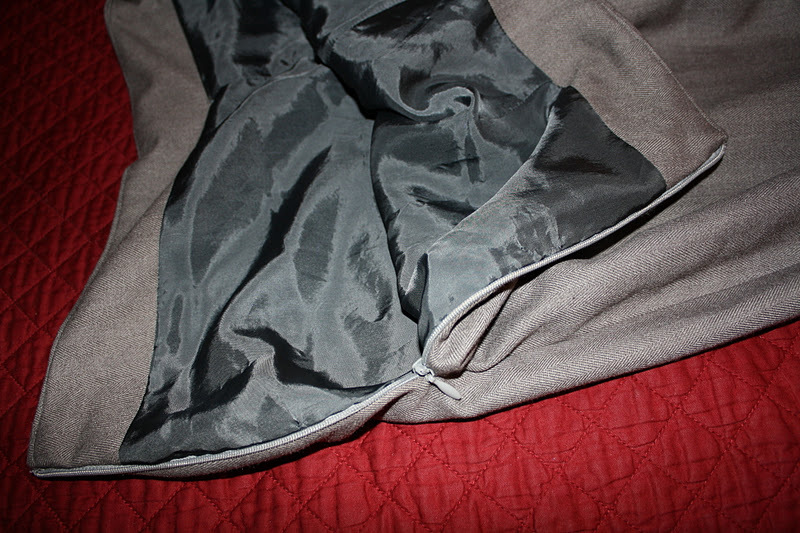 I think if I had used a stretch fabric I could have gone with a straight 42, but since neither my fabric nor the lining had any stretch I thought it would be better to go with the larger size. Were the instructions easy to follow? Erm… Mostly. Kinda. At least the instructions made sense until the lining was attached to the pants. At that point the Burda speak left me scratching my head. I think they wanted me to understitch, then ditch stitch at the front waistband? I did understitch, but I only tacked the front facing to the front waistband at a few points, instead of ditch stitching the whole length. Other than that section, the instructions were pretty simple. Did it look like the photo/drawing when you were done with it? Not as much as I would have liked. In the photos and drawings it looked like the pants were a bit more fitted through the thigh with a bit more flare at the hem. What I found was that these pants in practice looked a bit more straight-legged. They actually looked a lot like the 105 model photo in the magazine (styles 104 and 105 use the same pattern), but I was hoping for a bit more of a fitted look like the 104 pictures. I suppose the line drawing is a bit less shaped than I had originally thought, but I was trying to get a sense of the shaping from the magazine photos. What did you particularly like or dislike about the pattern? I did think the fit at the top of these pants is quite excellent. I usually have issues with the gaping at the back of the pants, but since these did not have a back waistband the fit in the back seemed much better than many other pants styles. I do think the fit is decent and they are very comfortable. However, I had been hoping for a bit more of a fitted look at the upper thigh with more flare at the hem. Even though I did alter the pattern to try to enhance the flare look the pants still seemed a bit more straight legged than I originally wanted. 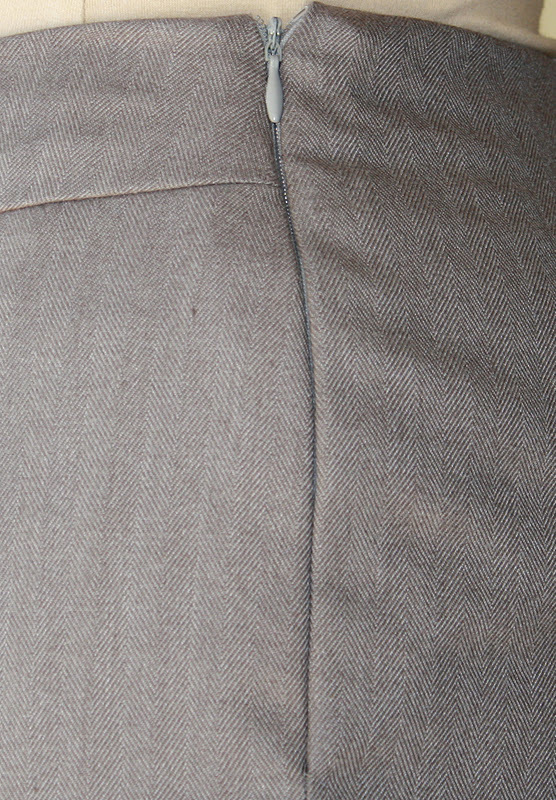 Fabric used: Polyester/rayon blend for the pants with Bemberg rayon for lining. This was my first time using Bemberg – it is so nice! The poly/rayon is actually quite soft while still being weighty and drapey. I think my fabric selection really helps me like these finished pants more than I would if I had used a different fabric. Pattern alterations or design changes you made: Mostly fit changes – I made the back darts a bit wider and I took out 6/8″ from the back leg pieces at the knee area. I also tried to adjust the shape to give a bit more fitted look through the knee. I didn’t press in the creases as much as I should have – they sort of uncreased after wearing them for a bit. Would you sew it again? Would you recommend it to others? I don’t know if I will sew this pattern again any time soon. I have quite a few pants patterns I want to try out on my quest for the ultimate TNT pants pattern. Something about this style just isn’t my favorite, despite the fact that I do like the fit at the waist. I would recommend this pattern, but with the caution that the results look a bit more like the style 105 photograph than the style 104 photos in the magazine. Conclusion: Not my favorite style, but I do like my finished pants. 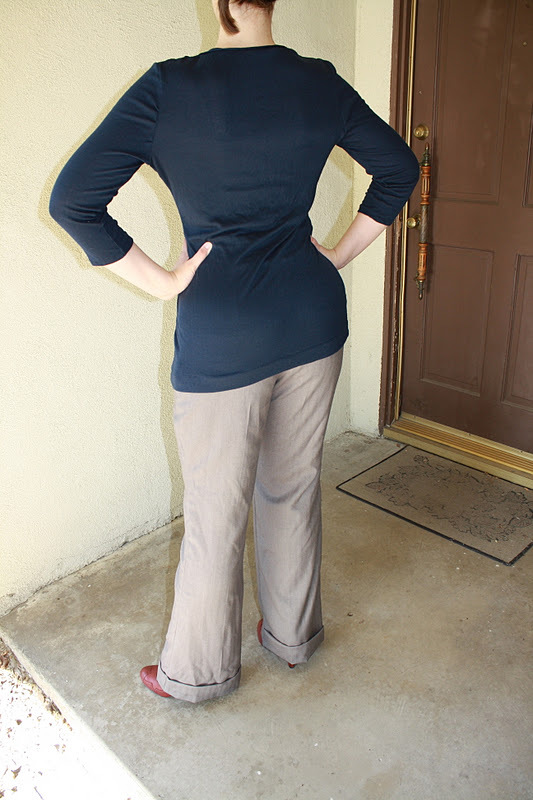 I am excited to try some different Burda patterns in the future because I do like the fit I get with Burda. I will probably get a lot of use out of these pants, although I don’t know how soon I would make this pattern again in the future. Basically the pattern is fine and I like my pants, but I think I should try some more styles to try to find something I like a bit better. So far on my quest for the perfect pants Vogue 1051 is winning out, but I still have a lot of patterns to try. I think my next few projects will be some quick tops, skating costumes, and pjs because I really want to do some instant gratification sewing. After that… I may want to make another pair of pants or perhaps a jacket or coat. We shall see how I feel when I get there. I definitely have a large enough pattern and fabric stash to choose from!